Lawrence & Associates > Blog > Disability > How Can Lawrence & Associates Help Me If Another Lawyer Drops My Disability Claim? How Can Lawrence & Associates Help Me If Another Lawyer Drops My Disability Claim? The following post is part of our Law Student Blog Writing Project, and is authored by James Haney, a Juris Doctor student at NKU Chase College of Law, Northern Kentucky University. It is always interesting when seemingly unrelated topics can be brought together to make a point, through some less than obvious comparison. With that in mind, consider the free agency period in any sport. For those unfamiliar, this is the time during the offseason in which teams make offers to players who are no longer under contract in order to entice the player to come play for them. With millions of dollars on the table for the player, and even more on the line when considering the success of the team, finding the right match is important. A team wants a player who will add not only talent to the team, but also work ethic, tenacity, teamwork, and a desire to win. The player is looking to join a team for the right price, as well as putting themselves in the best position to succeed. Choosing your lawyer is no different. Attorneys are often seen somewhat as lawyers first, and people second. That is to say, aside from the few famous names, most attorneys are seen as being comparable, if not the same, as any other. Any old name will do. Like with any profession, though, this is far from the case. In choosing a lawyer, one is hiring someone in whose hands they will place their very life. This becomes of great issue, very specifically, during claims for Social Security. As with any legal process, requesting Social Security consideration is a lengthy and labor intensive process. This is particularly true if an applicant has been denied at both the initial applications, as well as the Request for Consideration phases. Once denied at both levels, a claimant must begin a hearing with an Administrative Law Judge (ALJ). In Cincinnati, the regional office in this area, the average wait time from request to hearing is something around twenty (20) months. For a person in need of Social Security, twenty months is a very long time. Unfortunately, attorneys will sometimes drop clients during this time. This can even happen within only a few months of the hearing. The hearing stage is the most complex and time consuming for an attorney. After years of filling in forms and sending records, the attorney must now know a claimant’s records inside and out and begin to apply solid statutory and case law to the issues. A good attorney will write detailed briefs on behalf of the client, outlining the facts of the case, and steering the narrative for the judge in a favorable direction, acting as the chief representative of the client in a time of great uncertainty and stress. Regardless of how strong or weak a case may be, an attorney may deem that the time and effort required during the hearing phase does not balance out with the potential benefit. This is not necessarily due to any issues with the attorney, the case, or the client, but is rather, more often, a result of the culmination of various factors between the three. Due to the rigorous nature of the field of Social Security Disability, it is very important to choose an attorney who practices in the field regularly, as opposed to one who handles the odd case here and there on the side. An attorney whose focus is in the area is much more likely to see the entire process through, as they will be familiar with the system, and prepared for any eventuality that may arise. Think of it from a personal perspective: are you more likely to do well in something you know and are passionate about, or in something you were assigned off the reservation by your boss whom you already aren’t particularly fond of? This becomes even more true if the process becomes more complex than originally anticipated. In the unfortunate event that your attorney drops you during the hearing phase, it is of utmost importance to act quickly, as whomever replaces your previous attorney will have a lot of catching up to do, but only a little time to do it. Contact a new disability attorney immediately, and secure representation. It is also important to not allow Social Security representatives to set a hearing for you during a period when you do not have representation. When Social Security calls to schedule a hearing, if you are at the time without representation by an attorney, you should do one of two things: 1) ask them to schedule for several months out, or 2) refuse to schedule until you have attained representation. If you are already scheduled for a hearing when your attorney drops you and you do not have time to find a new attorney, go to the hearing and immediately explain the situation to the judge. If the judge is made aware, in a timely manner, that you do not feel capable of representing yourself, and that you need more time to obtain representation, they are almost certain to grant your request. Remember, the judge is there to ensure that the legal system is upheld correctly, and that justice is sought. It would be considered unjust by most to deny a person an opportunity to be represented in such a tumultuous time. When you finally meet with your new attorney, it is important to get them up to speed as quickly as possible. Be sure to explain that a hearing could be imminent so they will be able to take the necessary steps. Your new attorney will get access to your Social Security file promptly and begin preparing for the hearing. It is always a good idea to get your medical records straightened out, as well. The easier your attorney’s job is, the more likely you are to win. 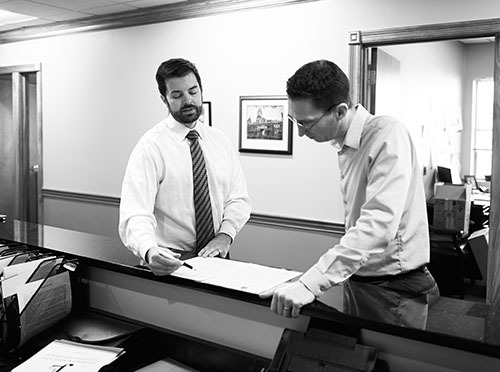 An attorney and the client are a team; they come together with a common goal, in order to be successful. Such is the case with any team, working together is highly important. Choose your team wisely, and be a good teammate. Doing that will set you both up for the best chance of success.